Galician is an Indo-European language of the Western Ibero-Romance branch. It is spoken by some 3 million people, mainly in Galicia, an autonomous community located in northwestern Spain, (top left-hand side) where it is official along with Spanish. It is a cold, wet climate, with rugged terrain and over 700 miles of rocky coastlines and historically one of the poorest areas of Spain. Small family farms of an acre or two exist growing vegetables, however many families live from the fish they catch. The people of Galicia are descendents of Celtic people, whose myths, legends and belief in the mystic are strong even today. People from all over the world walk "The way to Santiago"
This pilgrimage journey to Santiago can be done by walking, by bicycle or even by horse. It is a journey one will never forget because it will be the journey of your life, and perhaps even giving thanks for an answered prayer. You will experience peacefulness as you travel through breathtaking pure nature, and simply feel that going back to another age. One beautiful village where you can start your journey is St Jean Pied de Port, France next to Navarra, Spain, providing you are an experienced trekker as this journey can probably take about a month or more. I was there, so I can recommend this quaint village in the mountains. 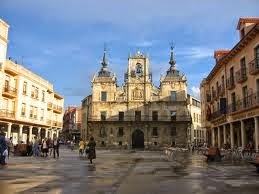 You can also depart from another beautiful village called Astorga, Spain. I was there walking around seeing it´s beauty and ending up having lunch in the main square.....simply breathtaking. 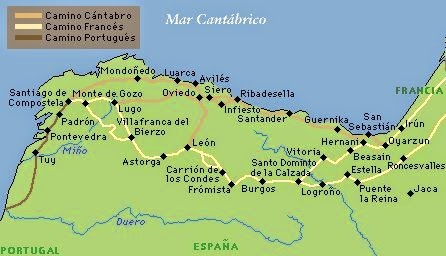 The journey from Astorga to Santiago can take around nine days. 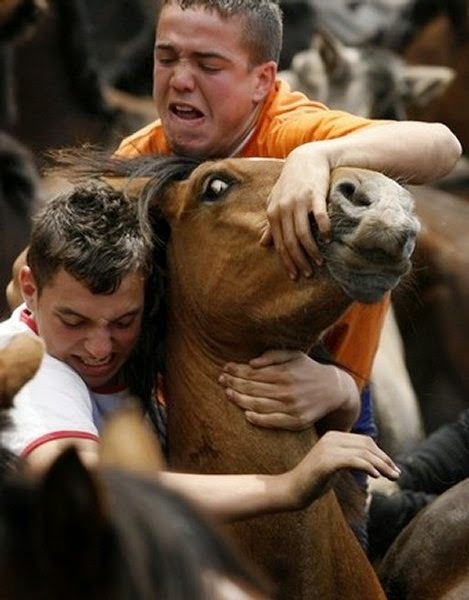 "Rapa das Bestas - Spanish Horse Wrestling Festival"
It takes place the first weekend in July in Sabucedo, Pontevedra. Galicia. 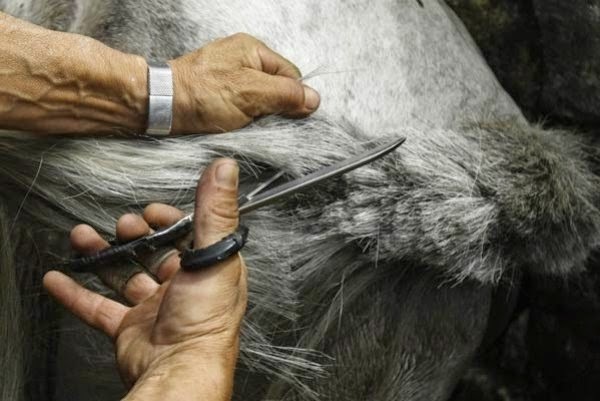 The horses are rounded up from where they live in the wild and brought into a corral..
People gather all the untamed horses in a corral, where men and women of all ages wrestle them to the ground with their bare hands to trim their manes and tails and brand them. This festival goes on for about three days starting the first Saturday of July. 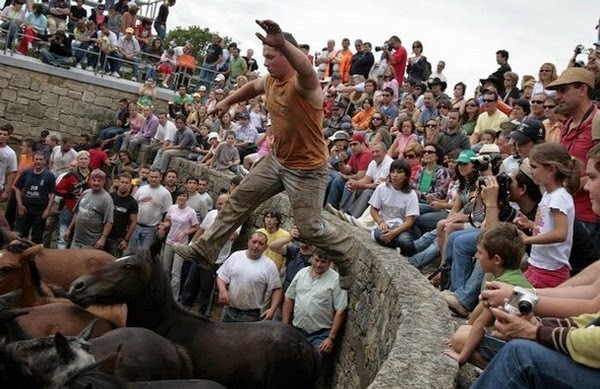 Or another festival called "Magosto"
Each region in northern Spain has its own unique twist on the castañada festival. In the Galician town of Ribadeo, for example, the magosto festival is celebrated in the market square where locals and visitors sample roast chestnuts, meat or fish pies and wine. During magosto, revellers (very happy and boisterous people) also prepare the traditional Galician fire drink, known queimada. 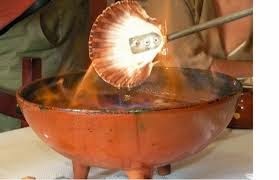 A special spirit drink flavoured with herbs or coffee, queimada is typically brewed while a spell is recited, then set aflame. If at first you only want to come Galicia to enjoy the local cuisine, you must eat "Pulpo Gallego" = Galician squid and "Empanadas" = Meat pies. 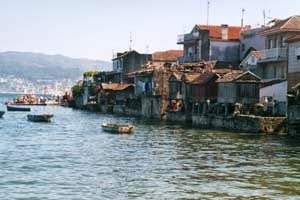 You can also visit this beautiful fishing village in Combarro to eat the delicious "Pulpo a la Gallega" or other kinds of fresh delicious seafood such as oysters, clams, giant prawns, mussels, or simply order a "Mariscada"; a huge platter of mixed seafood to make your mother water. The empanada, in English is called a meat turnover, “pasty” or meat pie. There are lots of different fillings, including meat, fish and vegetables. The ingredients of the fillings are chopped finely and mixed with lots of onion and some spices, then spread between two layers of pastry. Finally, it is baked and served hot. 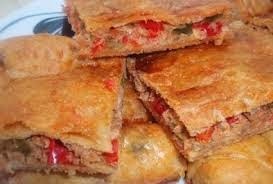 I especially love the delicioussssss "Tuna and red pepper Empanada"
And it is said that "Lacon con Grelos" may be the most famous dish of Galicia. Lacón is boiled meat from the front leg of a pig. Grelos are the leaves of turnips. The lacón and grelos are then boiled together and served with sausage and potatoes. And of course, don´t forget the famous Galician wines. 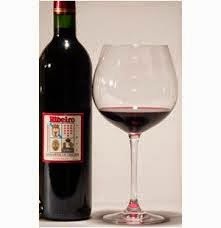 "Ribeiro" a red wine, and Alabariño a white wine...........which will make you very happy indeed. The "Echanted Moura", a supernatural being from the fairy tales of Portuguese and Galician folklore. She often appears singing and combing her beautiful long hair, golden as gold or black as the night with a golden comb, and promises to give treasures to whom sets her free by breaking her spell. (In Galicia, though, they are more commonly redheads). 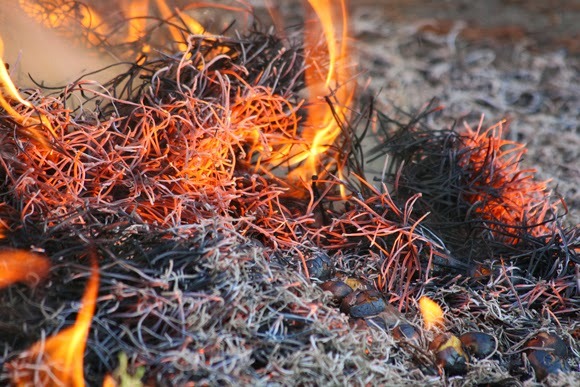 According to José Leite de Vasconcelos, mouras encantadas are “beings compelled by an occult power to live on a certain state of siege as if they were numb or asleep, insofar as a particular circumstance does not break their spell”. According to ancient lore, they are the souls of young maidens who were left guarding the treasures that the mouros encantados(enchanted mouros) hid before heading to the Mourama. The legends describe the mouras encantadas as young maidens of great beauty or as charming princesses who are "dangerously seductive". The mouras encantadas are shapeshifters and there are a number of legends, and versions of the same legend, as a result of centuries of oral tradition. 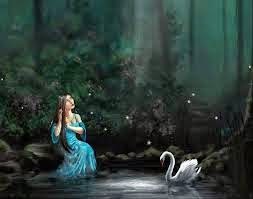 They appear as guardians of the pathways into the earth and of the "limit" frontiers where it was believed that the supernatural could manifest itself.Mouras encantadas are magical maidens who guard castles, caves, bridges, wells, rivers, and treasures. José Leite de Vasconcelos considered as a possibility that the mouras encantadas may have had assimilated the characteristics of local deities, such as nymphs and spirits of nature. Consiglieri Pedroso also referred to the mouras encantadas as "feminine water genies". The tales of the mouras are part of a wider lore of the "mouros encantados", who some times appear as giants or warriors, which also include the mourinhos or maruxinhos, a very small elf like people who live under the ground. Celtic lore, even nowadays, is full of magic and mystery, with a strong bond to nature. Like other European Celtic tribes, those of Spain adored the sun and the moon, and attached great significance to forests, rivers, wells, and mountains. The oak tree was particularly venerated (still a common feature in most Celtic societies), and worship was carried out in natural sites or clearings rather than temples. In Galicia, many people still believe in the power of witches and druids, in the transmigration of souls and in animals with special powers. They practice rituals similar to those in parts of the British Isles and Brittany. The Celts were pastoral by nature and little inclined to urban niceties. As a result, there is little construction left that reveals their presence, especially in the interior, although the original sites of some Celtic settlements may be identified by the ending -briga. What does remain is to be found in the north west of the peninsula, especially in Galicia and Asturias. Here archaeological diggings and reconstruction show that the Celts built their villages on hills for strategic defence, and that the houses were circular with low stone walls and conical, thatched roofs of straw and broom; there were probably no windows. The buildings –arranged somewhat haphazardly– housed both family and animals. These are common features of Celtic style in other Celtic lands: Scotland, Ireland, Wales, Cornwall, or Brittany for example. Ruins of Celtic castro or village. Wikipedia. 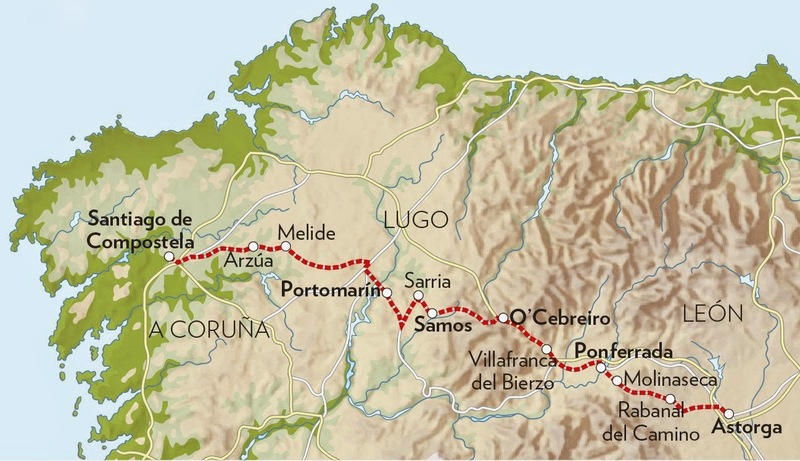 Modern day pilgrims travelling to Santiago de Compostela in Galicia can get a good feel for a Celtic village when stopping at the hamlet of O Cebreiro. A kind of time warp exists on this windy hilltop pass where a number of restored circular Celtic dwellings –called pallozas– evoke a distant time, especially when the mists and rains –so common in this area– are swirling around. Celtic Spain is now almost exclusively reduced to Galicia. It may come as a surprise to visitors that many Galicians are fair-skinned and that the green, mist-laden, hilly countryside is reminiscent of Ireland or Scotland. And they may be forgiven if they think they have landed in the Scottish Highlands if they hear the swirl of the bagpipes –the gaitas, Galicia’s native instrument– or witness the jig that often accompanies them. They may also be lucky enough to be present at dusk when a genuine queimada –a traditional fiery brew-- is being prepared to ward off the winter chills. Accompanied by the wails of the bagpipes, a bruxo or sorcerer dressed in skins and wearing a horned helmet will call on the powers of heaven and earth and the spirits of the sea and fire as he stirs and ladles the flaming, potent drink. The witches of MacBeth would be at home here!